The more quilts I make, the more I come to appreciate simplicity. After finishing the Epic Game of Thrones Quilt, I needed an easy project that would be less mentally taxing. 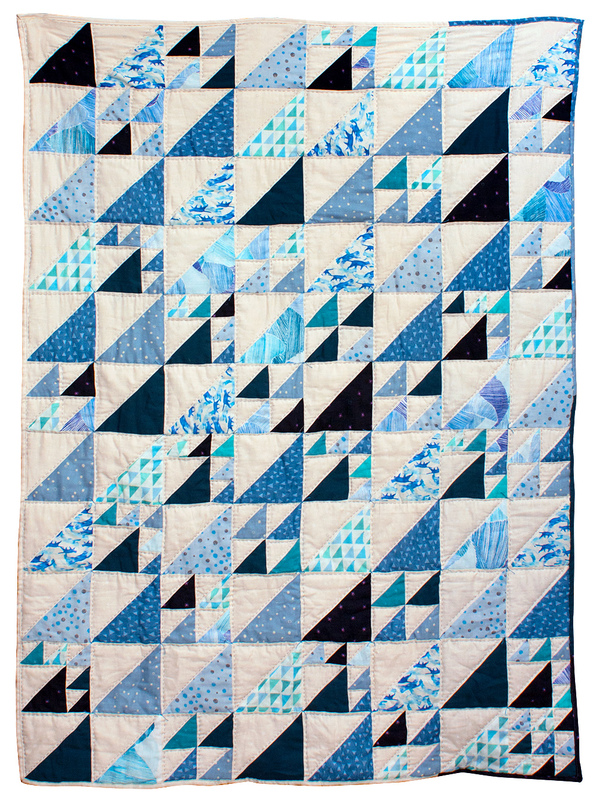 Without too much thought, I started making half square triangles with my collection of double gauze prints. At first I made a bunch of 6" HSTs, which is the largest size I can make with my bloc loc ruler. Then I started using small scraps to make 4", 3", and 2" HSTs. When I was tired of making blocks, I connected the smaller HSTs to make 6.5" x 6.5" unfinished blocks and randomly arranged them. They reminded me of icebergs poking out of the water, hence the name. Pressing double gauze seams can be...obnoxious. Since the farbic doesn't have much body, the seam allowances aren't inclined to hold their position. I got frustrated and lazy during the process and pretty much threw seam nesting out the window. I would just mash them flat with my iron and sew them. Surprisingly, it doesn't seem noticeable in the finished quilt. I pieced some wool batting scraps together and made a backing from my unbleached Cotton + Steel double gauze and some larger blue double gauze scraps. 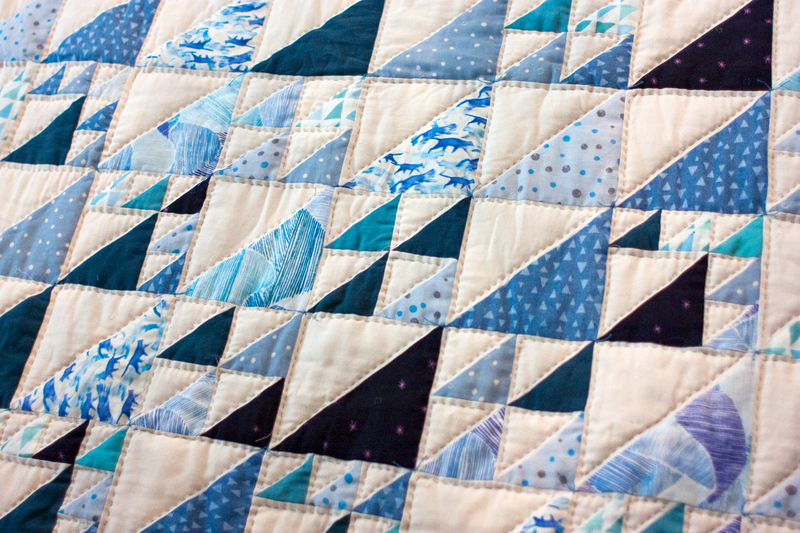 I tied all the intersections with blue perle cotton before hand quilting all the background triangles. Instead of a traditional binding, I did a self-binding finish using some of the excess backing. I machine stitched it down because I was concerned about fraying. Either way, it's super cuddly. I have read a few comments that DG pills and gets fuzzies. I am making a baby quilt and know it will be washed a ton. Have you encountered any issues? Where did you read that? I've used DG for both quilts and clothing and never seen a single pill/fuzzie. Pilling is more common with knits than woven fabrics. However, I will say I've noticed a huge difference in quality in some DG products that have been brought to market in the past year. Since Cotton + Steel and Japanese manufacturers have successfully introduced the substrate to the US, a lot of companies started jumping on the bandwagon...with noticeably lower quality. As a general rule I've found that any double gauze that is marketed primarily for sewing for babies tends to be poorer quality with a looser weave (which may lead to pilling). I've personally sewn with DG from Cotton + Steel, Andover, and several Japanese brands, which were awesome. I handled Birch's DG at Quilt Market, and it seemed nice as well. I was less impressed with DG from Michael Miller, Shannon, Camelot. I wouldn't purchase those personally.